One thing I love about the LookFantastic beauty boxes is that they ship out on the first week of each month, so you get them within a week, tops, wherever you are around the world. No need to be waiting for this beauty box well into the following month. For those who came in late, LookFantastic beauty boxes are sent out worldwide from the UK. You can check out my previous LookFantastic boxes here. With a growing number of calls for including makeup in these boxes, LookFantastic has obliged this time. The downside, for me, is that makeup is something that needs to be customised, more than skincare. On the other hand, you never know when you might discover an amazing eye or lip product that works for you. 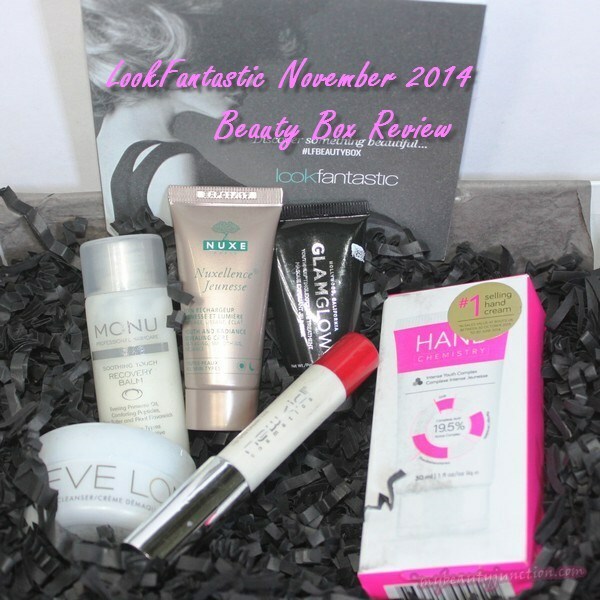 Read on for my unboxing of the November 2014 LookFantastic beauty box. Here are my first impressions of the contents. 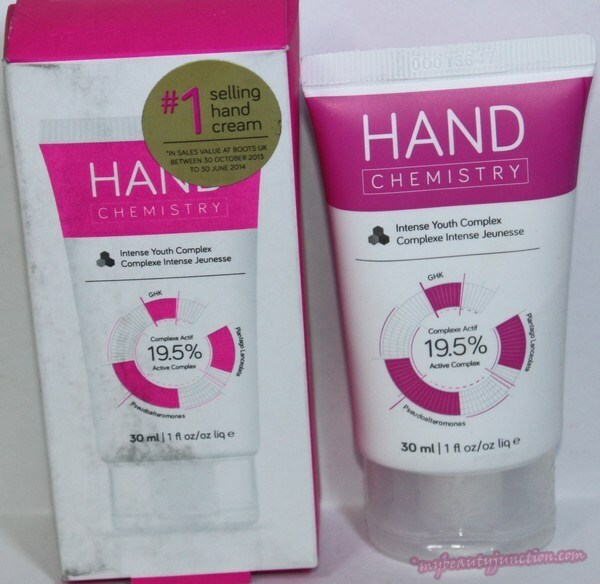 This is the best-selling hand cream in Boots UK from October 2013 till June 2014, and apparently you can see visibly younger and softer skin within 11 days of use! I love receiving hand creams in beauty boxes and hope this puts paid to my dry cuticles forever. This balm-cleanser has been chosen by Vogue magazine as the "best cleanser in the world". It contains chamomile, eucalyptus, cloves and hops and will remove every last trace of makeup. 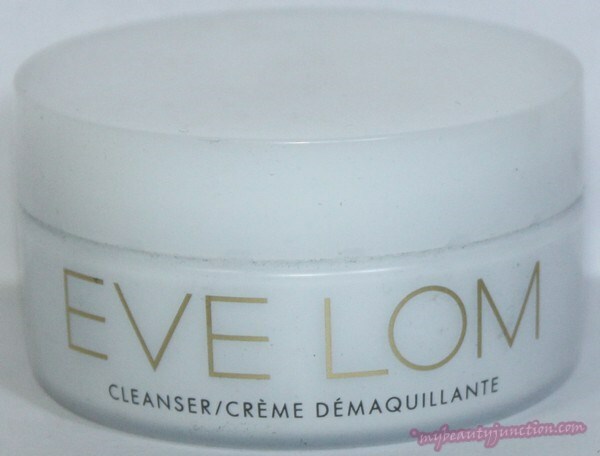 My first Eve Lom product, I have tried this out once and yes, it certainly does what it says and is better than any cleansing oil. Detailed review soon! I have been wanting to try out Monu skincare for a while, especially their Renu range for obvious reasons. This is a night-time recovery balm for sensitive skin. It contains bergamot, shea butter, soft rose, evening primrose and blackcurrent seed and peptides and is paraben-free. Massaging it in and leaving it overnight will give you super-soft skin in the morning. 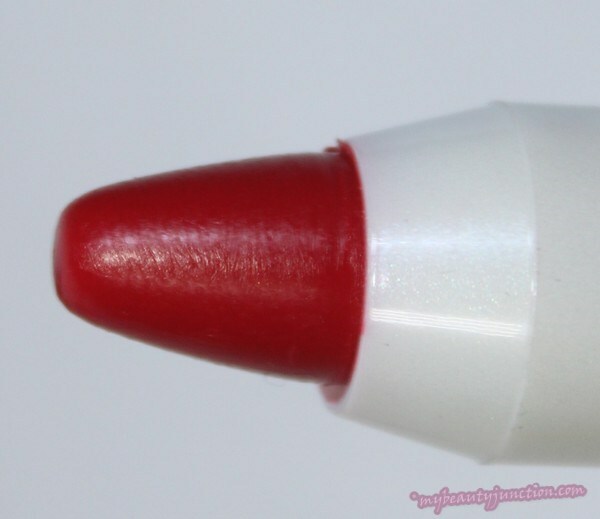 A retractable chubby pencil that serves as lip and cheek tint and lip liner, this is the first time LookFantastic has included makeup in their beauty boxes. While I love receiving lip products in beauty boxes, I do wish they allowed some customisation, since I only ever use dusty rose and subtle neutral shades. They have sent me Strawberry Souffle, so I will have to see if I can swap it somewhere or sell it. I think eyeliner, eyeshadow, mascara and primer are a lot more universally acceptable and there is no need to customise them all that much. I hope LookFantastic sends out some of those products in future beauty boxes. I already have both these products. GlamGlow, reviewed here, is amazing and I have the full-sized version. I am glad to have this deluxe tube, given the cost of this product. Nuxellence Jeunesse is a great hydrating anti-ageing fluid which does not break me out. I have three of these deluxe tubes already LOL. I love everything in this box except for the shade of the lip crayon. 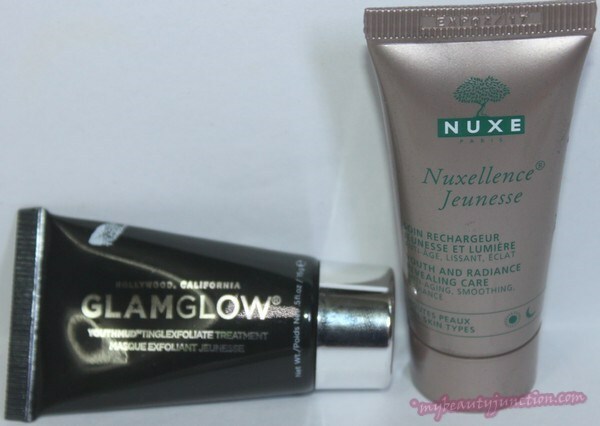 And, perhaps because I already have GlamGlow and Nuxellence Jeunesse, I prefer the previous LookFantastic beauty boxes to this month's. In terms of brands sent out, this is a great box with no drugstore brands, and some cult products. Just cribbing on a personal level. I hope I am lucky enough to receive products I do not have in the December LookFantastic box. LookFantastic ships worldwide. The box costs £15 and postage varies depending on where you live. Check out the rates here and you can also order the December LookFantastic beauty box. It ships out on the first week of December. So far, I have not hated even one box, so I am expecting the December box to rock.